Mealtimes come to represent the communal idea in the household. I’m glad I finally got to see this at a public screening (thanks to Square Chapel, Halifax). The Commune is partly a nostalgia trip for those of us who lived through the 1970s – though I was younger than the main characters, I can still recognise the world depicted here (meant to be 1975). Co-writer/director Thomas Vinterberg has his own memories of life in a commune as a small child but his writing partner Tobias Lindholm was not born until 1977. How then did they do in creative terms? 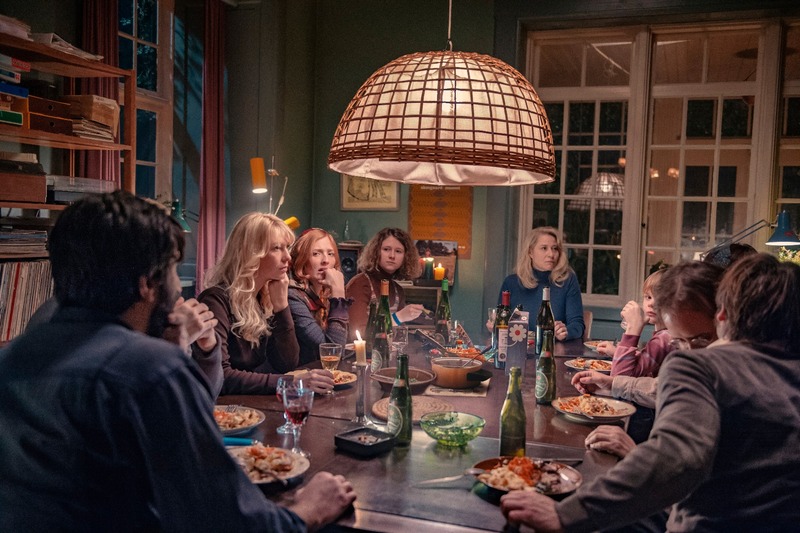 I’m not sure how Danish communes compare with their Anglo-American counterparts but the commune in this film strikes me as a little unusual since it is based in a large suburban house in the suburbs of a coastal town. The house has been left to a couple in their forties with a 14 year-old daughter. Erik, the architecture lecturer (Ulrich Thomsen) wants to sell the house, but his wife TV newscaster Anna (Trine Dyrholm) thinks their family life needs a change and she urges Erik to agree to invite friends to join them in a communal household. My sense of communes tend to be of smallholdings and rural communities or urban squats. This one seems rather bourgeois. Erik and Trine seem too ‘established’ to be in a commune – but they are joined by a younger couple with a child and some singles. The narrative then finally takes off when Erik, still confused by his role in the new set-up, falls for one of his students, 24 year-old Emma. The narrative promises an exploration of communal life with some great scenes by the sea with everyone together, but then it becomes the story of a marriage and a family and the commune becomes simply the difficult context in which the marriage founders. Having said that, I think the representation of the commune is fair. Quite a few reviewers seem to have assumed that a commune must be about ‘free love’ and that everyone would be swapping partners. That doesn’t happen, but for me it was the other absence that was telling. Reviewers refer to this group of ‘leftists’, but actually there is very little discussion of politics as such and little sense of political activity. I tend to agree with something else that I read, that this script might have been better developed into a TV drama series (or, at the least, into a longer film). Perhaps then some of the stories about the other characters might have been developed further. I did enjoy watching the film. Vinterberg and Lindholm are too experienced and professional to fail to make a film like this watchable and Thomsen and Dyrholm are very good. Trine Dyrholm in particular makes a viewing experience worthwhile. She always gives everything she’s got. It’s good to see the 1970s too. I liked the decade and its political struggles. I guess we smoked too much, but the clothes were comfortable. This entry was posted in Danish Cinema, Melodrama, Nordic Cinema and tagged Thomas Vinterberg. Bookmark the permalink.